Her beautiful watercolor renderings of buildings and landscapes became known as a staple of Wright’s style; over fifty of them were included in the Wasmuth Portfolio, a two-volume folio of one-hundred lithographs of Wright’s work, published in Germany in 1911. The portfolio served as a significant link between Wright and the first generation of modernist architects in Europe, like Le Corbusier, Rudolf Schindler, Richard Neutra, Ludwig Mies van der Rohe and Walter Gropius, who were all known to own or at least see first-hand copies. Wright never gave proper credit to Mahony Griffin, whose visual style had a lot to do with the publication’s success and influence. She then went on to be eclipsed by another man when she assisted her husband, architect Walter Burley Griffin, in his own work. It is believed Marion’s watercolor perspectives in the international competition to design Australia’s capital city of Canberra in 1911 is what led Walter to win first prize, beating Eliel Saarinen of Finland and Alfred Agache of Brazil. In 1914 the couple moved to Australia to oversee the construction of the city where they stayed until Walter’s unexpected death in 1937. During a lengthy visit with her family back in Chicago in the early 1930s, Griffin created a very elaborate mural at George B. Armstrong School, where her sister Georgine was an art teacher. 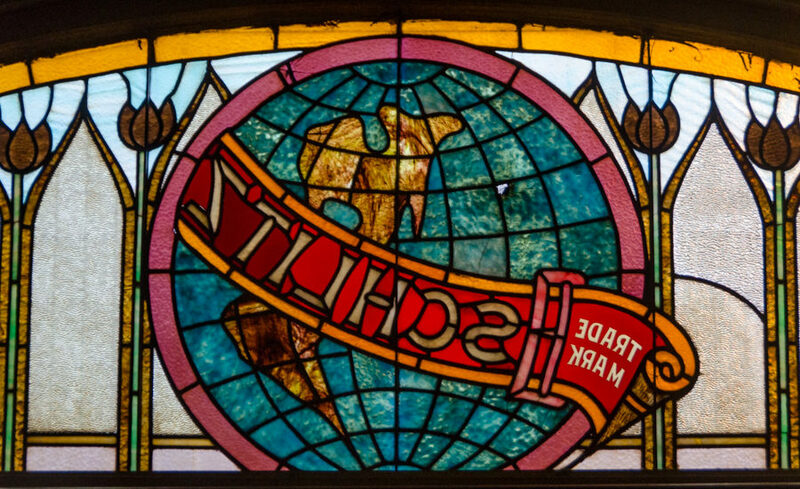 A gift from the eighth grade graduating class, the then 60-year-old Mahony Griffin painted the two-panel five-by-twenty foot oil on canvas mural along a main corridor of the original school building. A number of students recalled seeing an old lady come nearly every day to work on it while classes were in session. She found inspiration from the teachings of Rudolf Steiner and his anthroposophy philosophy. 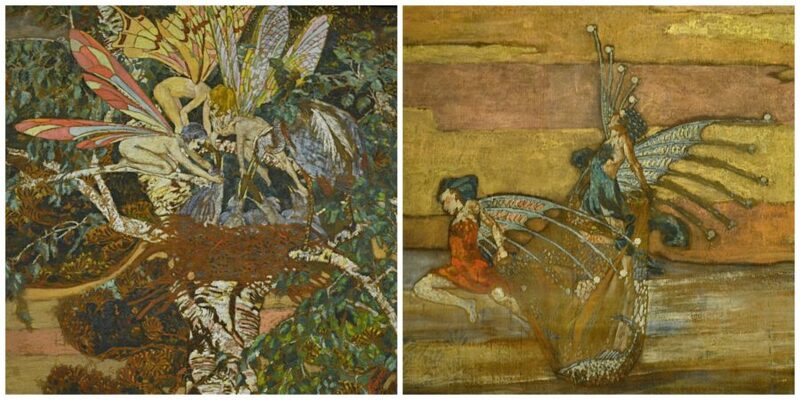 On the left side of the mural, a group of fairies feeds a nest of young herons. While on the right side, another set of fairies assists the male heron in securing food for his young. Painted with such confidence and effectiveness, Mahony Griffin must have worked on other murals before, yet this is the only one known to survive. Unfortunately a wooden door, which appears to go nowhere, is right in the middle of it. No one knows exactly why the door is there, but an addition to the school might be the reason. 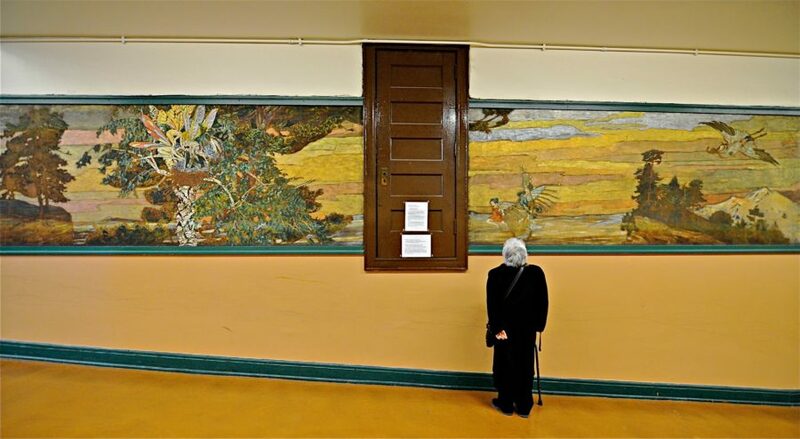 The door was already in existence when Mahony Griffin painted the mural, which was restored during Phase II of the Board of Education’s Mural Restoration Project in 1997. Leaving the United States led to a fractured legacy for the Griffins. Most, if not all, Australians are aware of Walter Burley Griffin and Marion Mahony Griffin. Yet the same cannot be said for their hometown of Chicago. Marion spent the last thirty years of her life in relative obscurity. With the exception of a handful of homes in Grand Rapids, Michigan and Decatur, Illinois, little of her built work survives. 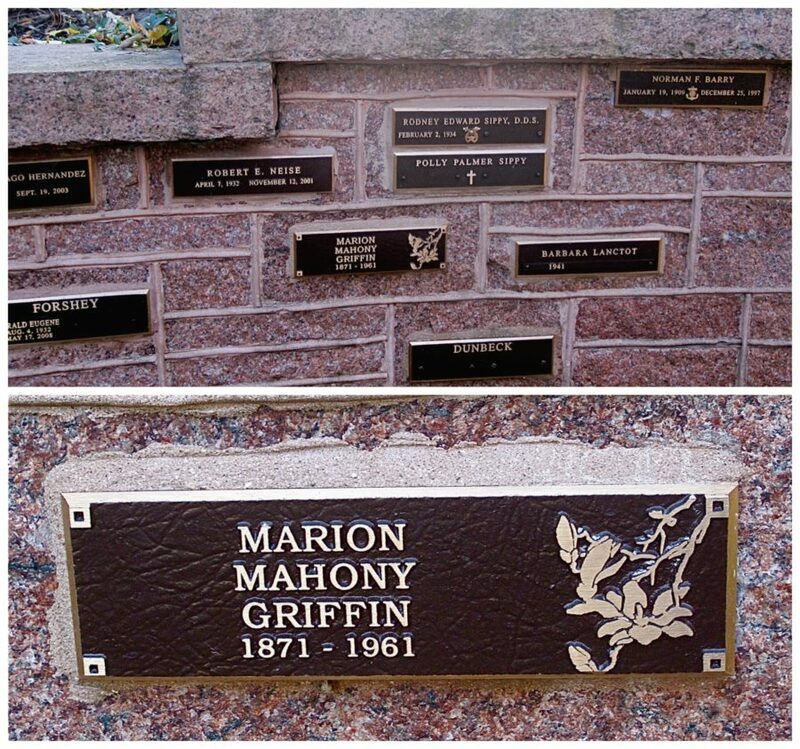 In 1961, Marion Mahoney Griffin died a pauper at Cook County Hospital at the age of 90. Her ashes were interred without a marker at Graceland Cemetery, where other well-known architects are buried, including Louis Sullivan, Daniel Burnham, and Mies van der Rohe. It was not until 1997 that her grave was properly recognized with a plaque. Rarely known outside of architectural circles, Mahony Griffin was not just an important member of the Prairie School movement but ahead of her time as one of first female licensed architects. Her marginalization has now been questioned and reassessed over the last decade. 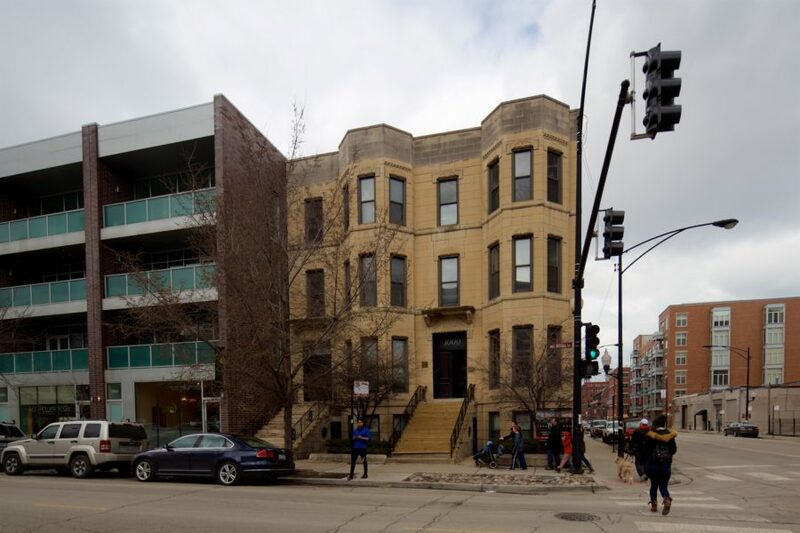 In honor of Women’s History Month, it seems appropriate to honor this Chicago native who was a role model for a generation of women wishing to practice architecture in a male-dominated profession. This is a wonderful article. I am very pleased to learn of a mural of this unsung hero is in existance. I really enjoyed seeing the mural. Thank you for providing such interesting and valuable information. Do graduating classes still present the school with gifts at year’s end? Good question! Unfortunately I forgot to find out that information when I visited the school. There is a Walter Burley Griffin Society group that keeps the legacy of the Griffins alive. There is also a collection house by the Griffin down in Beverly Hills Chicago. There are several books about her and her husband. Two American Architects in India: Walter B Griffin and Marion M Griffin 1935-1937 and Marion Mahony and Millikin Place. There is also a book on her paintings too, but I cannot get my hands on at the moment. When you hired Walter, you also got Marion. A great deal for the customer. Yes, I’ve attended one of the WBG Society events. Thankfully, the Griffins’ legacy is being kept alive by the group. 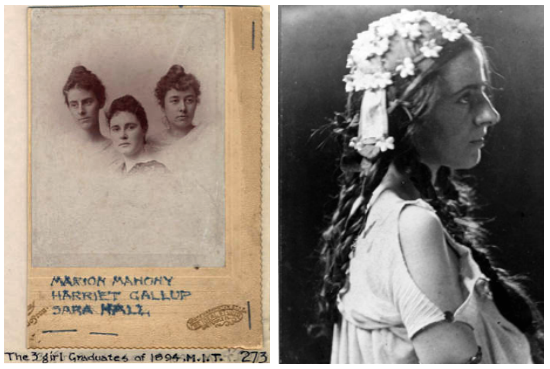 Although there have been a number of books, exhibits, and even a documentary made about them, Walter and Marion are still not widely known by the general public. Marion especially deserves it…for being so ahead of her time as a woman in a field usually dominated by men. This little article highlights one of the few remaining pieces of works she ever did in her own name. This is about her legacy, not the one tied to Walter. There was a great exhibit at the Elmhurst History museum that just ended on March 12, 2017. Thanks for bringing her work additional attention. She was overshadowed by several pivotal prairie school architects (men). Yet Wright and Griffin’s work would not be as important without Marion. Thanks again! Nice to see MMG and her mural getting some attention! There is now a great deal of scholarship on the Griffins– much of it from Australia where MMG is better known. 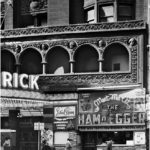 I had the pleasure of writing the recent Elmhurst History Museum Exhibit – and hope the Museum curator did deposit the various books used in the exhibit have been given to the local library– so that anyone reading this can do some research on the G’s. Other good sources are the Australian Walter Burley Griffin Society site– and of course the more recent WBG Society USA. The Elmhurst exhibiton”In her Own Right: MMG” is now showing in Mason City Iowa (thru August) for anyone who missed it in Chicago.